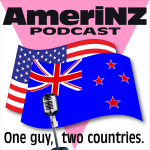 » AmeriNZ 339 – Winter ills AmeriNZ Podcast: One guy, two countries. This is a short episode, mostly to tell you about something special I did today. I’ll be sharing something on this podcast feed in a couple days. I also have some health updates, including that I had two winter colds. There are also a couple updates to what I talked about last time. I was a guest on ArcherRadio! 2 users commented in " AmeriNZ 339 – Winter ills "
Exactly. It’s really only relevant when the subject is “people we know but don’t know in real life”, and how often does that come up?